Hello, Patricia here today. I have been playing around making Christmas cards and got my newest dies from Dies R Us. And I could not resist to use them to share one of my CAS Xmas cards I made. I used the Snowflake Collage and Warm Wishes Border from Memory Box . I first die cut the Snowflake Collage using pearlized snow white cs and then cut a piece of navy blue cs and add it to the back of the first pearlized layer. Left a irregular cut at the bottom of the first layer so you could see a small border of the navy blue and also see it thru the snowflakes cut out. I cut out Warm Wishes Border using red cs and instead of layout it out horizontally I layered out vertically from top to bottom. I was not sure at first but when I see it presented, I love it! Everything was layered on the white card base and embellish it using some clear rhinestones to the snowflakes. I love the CAS of the design on this card and all the ideas that came to my mind while creating the card... I know have like a hundred ideas to use this same dies. 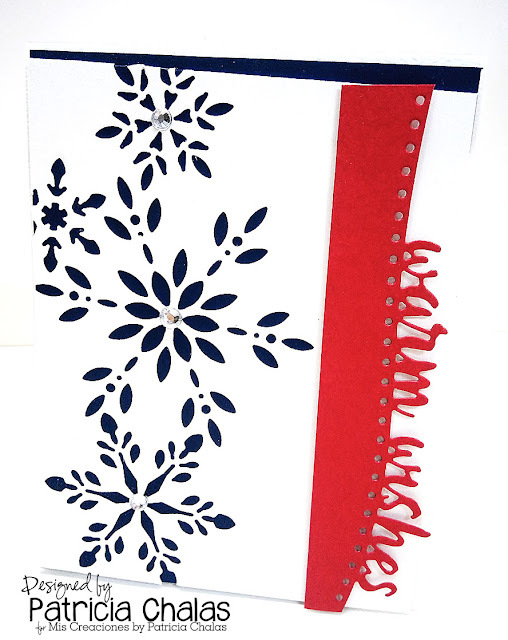 Oh what a lovely design for a Christmas in July card and the red, white & blue is unexpected and fun! The rhinestones in the centers of the snowflakes are a perfect way to finish this off. Just stunning Patricia! Great job Patricia ... well there's 2 more dies added to my ever growing list of 'I NEED that crafting goodies'! LOL This would be a quick yet eye popping holiday creation ... thanks for inspiration! Thank you Darlene! I just keep adding more and more dies too!! Super cute! Love the wordy dies cut and your pretty little snowflakes! very cute, like how you used the sentiment die! thanks Connie is one of my FAV right now!! Gorgeous card and love how you turned the sentiment die on the side like you did. Thanks for sharing and showing how dies can have different looks when turned slightly. Thanks Ann, I just wanted to tried something different since I love Vertical card now! Fabulous Christmas card Patricia, I particularly love the snowflake collage die, one to add to my ever growing wish list I think! Hey Janice! Thanks mine keeps growing every day tooo!! Great card Patricia. Love the snowflake collage. I love the way you have used the black and white theme with a bold touch of the special winter wishes, Patty!